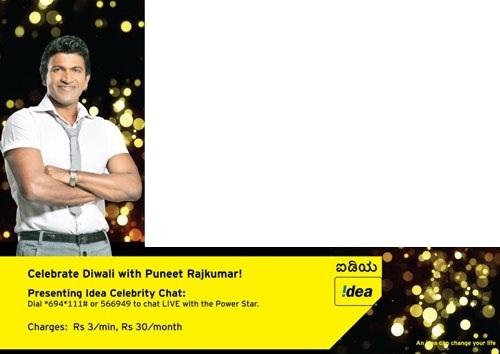 IDEA Cellular has announced that for the occasion of Diwali subscribers in Karnataka can connect with Kannada superstar Puneet Rajkumar through a Live Celebrity Chat. Idea subscribers in Karnataka who wish to talk to sandalwood superstar Puneet Rajkumar can call on 566949 from their Idea mobile on 26th October, 2011 between 3:00 to 4:00 pm. As a special gift on the occasion of Diwali, Idea will get its users to talk to their favourite star on a real-time basis. Idea users can avail the service for Rs. 30 per month, and call charges of Rs. 3 per minute will apply to the celebrity chat.